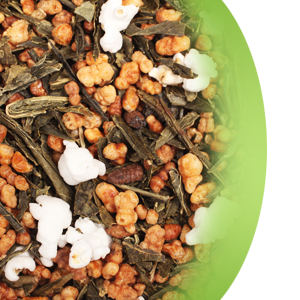 Genmaicha, commonly called Popcorn tea, is an exceptional Japanese specialty. Genmai means natural rice. It is popular to eat the swimming rice before drinking the tea. This exotic blend consists of Japanese green Bancha enriched with partially peeled rice. Medium bodied in cup, with golden-greenish liquor and a sweet nutty & toasty flavor, it is enjoyed after dinner or prior to bed time. Fantastic savory tea, also very tasty when served iced.